While I would not say that I am anti-Record Store Day per se, I also would not consider myself on the pro side of the debate either. Every year there are releases that I get excited over but I will not line up early in the morning to purchase them. This year there were three records that I was interested in and thus far, I have been able to purchase two of those without having to resort to paying inflated prices. I could theoretically purchase the third, LCD Soundsystem’s box set of their final show, but to be perfectly honest I have not felt like paying $135 for the honor considering how much I paid to attend the show itself. The two I was able to get my hands on, “Learn to Obey” 7” single from OFF! which we will be talking about at a later date, and “Rock, Rot, & Rule” from Scharpling & Wurster. As the precursor to The Best Show on WFMU, “Rock, Rot, & Rule” is the birth of Tom Scharpling and Jon Wurster’s comedic phone calls. Tom was just a DJ playing records at New Jersey radio station WFMU at the time while Jon, the drummer for Superchunk plays Ronald Thomas Clontle, author of the book Rock, Rot, & Rule. Being billed as “The Ultimate Argument Settler”, his theory is that all bands can be categorized as either rocking, rotting or ruling based on his research of asking the patrons of a coffee shop in Lawrence, KS and a record store near his grandmother’s house in Gainesville, FL. Some examples he gives are The Beatles only “rock” due to writing some stinkers like “Birthday”, Madness “rules” because they invented ska, and Frank Zappa “rots” because humor has no place in music. There is also a “none of the above category” featuring Sebadoh, Pavement, and The Mighty Mighty Bosstones. As the discussion goes on clueless listeners begin to call in to argue with the author but neither Tom nor Jon ever break character. Little did anyone know how legendary this call would become and luckily Tom had the foresight to record it. Mocking both the endless stream of guide books that claim to help you learn everything about a subject and the music snobs that argue relentlessly about these types of things, Tom and Jon never miss a beat even when faced with angry callers. Jon particularly shines here due to his indifference to the whole matter as a result of placing a large bet on a basketball game going on at the same time. For Record Store Day, Light in the Attic Records put out a limited red colored edition that looks and sounds great for what was probably a recording from a cassette tape seventeen years ago. This record is a must have for even the most casual of fan of comedy or rock history and there will be a wider release later this year on black vinyl. 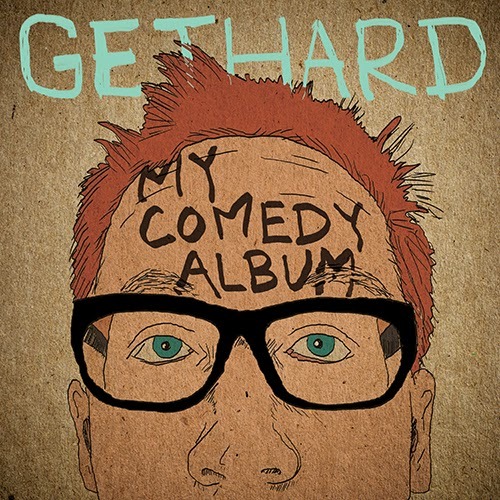 Released just days after Record Store Day, Chris Gethard’s “My Comedy Album” (Don Giovanni Records) is the perfect introduction to the host of the The Chris Gethard Show. Known for being one of the best storytellers to come out of the Upright Citizen’s Brigade Theatre, Chris’s sense of humor is accessible to anyone that ever felt like an outsider. Recorded live at The Creek and The Cave (Long Island City, NY) Chris takes through his adventures in taking molly at Bonnaroo, what type of commercials are being aired during “I Survived”, and going from a punk to wearing J. Crew. Without spoiling too much of his live performance, I found the highlight to be how he came to have a Morrissey lyric tattooed onto his bicep. The album is a window into his life experiences which can range from relatable to cringeworthy but always hilarious. The record includes a beautiful poster featuring some motivational words from Chris and a second album of bonus material is included in the MP3 download. He is truly a great inspiration to all of us who have felt like they didn’t belong, we here at Borrowed Nostalgia are not shy about our love for Chris and wish him only the best of luck in the future.